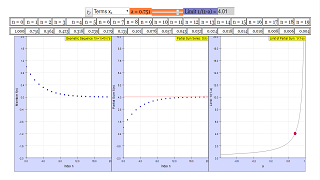 In the simulation you can vary parameter a by a slider in the range -1,05≤ a ≤+1,05 . Reset returns to the default value 0.5 . The interesting issue is if the series will have a finite value (a limit, if the series is convergent) when the index grows unlimited, or if it goes to infinity (the series is divergent). This depends on a. The left chart displays the members of the sequence, while the middle chart those of the partial sum series, both in dependence on the index n. On the right, the chart of the limit of the series of partial sums is shown in dependence on a, with a red point for its chosen value. The values for each term can be viewed in the table above the graphs. You can toggle between viewing the individual terms of the sequence or the partial sum of the series using the combobox provided. The partial sum series converges to 2. How does the sequence evolve? Try mentally to explain to a child how summing infinite finite numbers, none of which has a zero value, can lead to a finite value! Obviously convergence of the partial sums needs a < 1. What is the condition for the members of the sequence? E3: Choose a < 1. E4: Observe the red point in the limit window and compare with the series charts. E4: Imagine: a = 0.5 . Now 10, 1000, 1000000 members of another sequence with increasing member value, whose respective sum is 50, 1000000, 1012 is added to the geometric series. Will the total sum be convergent? If yes, what is its limit? E5: Which range of the index decides if an arbitrary series with finite members is convergent or not? where a is the first term of the sequence, and r is a constant, also called the common ratio. where the terms of the sum continue indefinitely. This simulation sets the first term of the sequence to be 1, and the common ratio in the simulation is denoted as a. From here on, a will denote the common ratio used in the simulation. There are 3 graphs in the simulation. The leftmost graph plots the first 20 terms of the geometric sequence, the center graph plots the partial sum of those 20 terms, and the rightmost graph plots the limit of the series as the common ratio achanges. The red arrow in the center graph denotes the limit of the partial sums as the number of terms approach infinity. The common ratio, a, can be changed using the slider at the top of the simulation, and the field to the right of the slider displays the limit that the sum approaches (1/(1-a) for |a|<1). The combo box allows you to toggle the array display between showing the terms of the sequence and the partial sums up to a certain term.